Damart is a French clothing company founded in 1953 by three brothers. Since then the family-run company has expanded so much that is has over 10 million customers worldwide. It's UK base is in Yorkshire where it employs a friendly team to deal with customer phone calls and orders. I would say Damart's website and products are aimed at those of us the wrong side of 40. Clothing is made for comfort, with lots of bright prints, and flattering designs. If you pick well you will find some great items and prices aren't too expensive either. Check out my holiday shop wishlist below and go to the bottom of the post to find out how you can win £50 to spend with Damart. This longer length blouse has a Tunisian style collar and a cheerful floral print in bright pinks and greens. In an easy care fabric, this blouse is perfect to wear with jeans or pedal pushers. Priced at £29.00. This tropical print swimsuit just makes me feel happy looking at it. It looks like it will give you a great shape but hasn't got those pesky underwires digging in. It is made from an easy to care for fabric made of polyester and elastane and is machine washable too, priced at £39. Another flattering tunic is a blue print this blouse is perfect for a casual look with jeans, leggings or cropped trousers. In a natural breathable fabric this top is perfect to pack in your case for that easy to wear look. These blue cushioned sandals have a leather insole and flower detail with contrast stitching. I think these sandals would be very versatile, being both great for strolling along the beach or shopping in town. The cushioned soul would make these supremely comfortable. Priced at £25 they are a bargain price too. Damart sells a range of other items too for the home, including duvet covers, bathroom towels and garden accessories. Items are well designed and fairly priced, so I recommend having a look. Today on my blog you can win a £50 voucher to spend on the Damart website. Entry is via the Gleam app below. Also, check out my competition to win a canvas with Canvas Champ. Good luck! 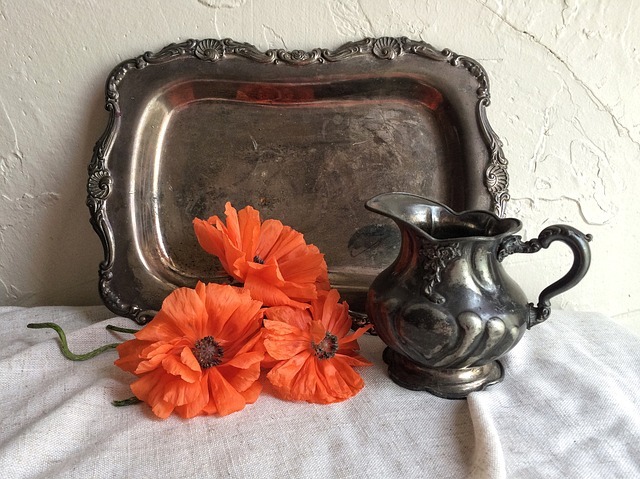 If you’re lucky enough to own antique silverware, perhaps you have inherited some from a family member or you love collecting antiques, then you will want to ensure that you look after its beauty and protect its value. 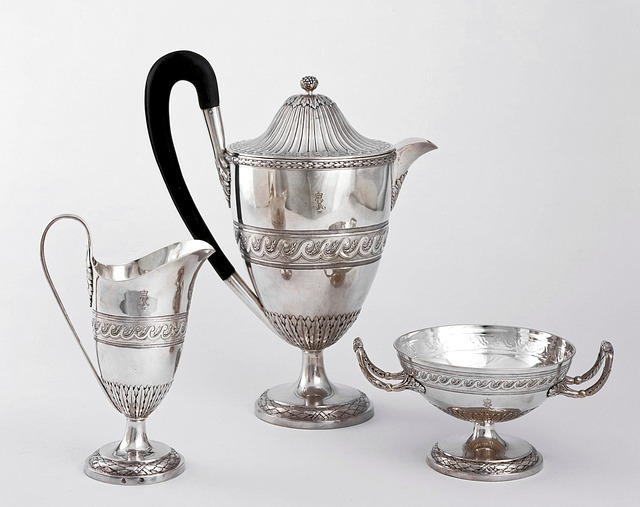 Antique silver can add a touch of luxury and elegance to any home but it can be tricky to look after and maintain unless it is properly stored. Here is a guide to how to store and look after antique silverware. Silver is an interesting metal and reacts with the air, food and water, which means it can tarnish easily. Silver sulphide is the chemical term for tarnish, which is the yellowish colouring (light tarnishing) or black film (heavy tarnishing) that you can see on silver that hasn’t been protected or polished. Tarnish can't be washed off but with a little care it can be prevented and with the right products removed and protected. Silver tarnishes much quicker when damp, and needs an adequate level of ventilation so avoid putting these items in a damp cellar or stuffy attic. To preserve your antique silverware it’s often best to use an airtight container and place it somewhere in your home that is safe from oxygen and external pollutants to avoid tarnishing. For example, opt for a cool, protected place, such as a sideboard or drawer in your spare room — away from windows. Pure silver is also soft so you can also get scratches and dents if stored with other items so always keep apart from other household items. Acid-free tissue paper and sealed polythene bags: make sure you squeeze the air out before sealing and add silica gel to absorb any excess moisture. Airtight chests or boxes: able to keep humid air and oxygen away to protect silver collections from tarnishing. However, this can take up a lot of space and, if you accidentally choose an airtight container made from a harmful material, you will trap the problem inside with your silverware. Anti-tarnish bags: available in a range of sizes and ideal for smaller silverware items. But avoid plastic bags — these will trap moisture and quicken the tarnishing process. Cloth rolls: a compact way to safely store silver items individually, especially cutlery. However, this method leaves silver exposed to the air and you must make sure that the fabric isn’t harmful to silver. If you are storing your silverware, silica gels, chalk and anti-tarnish strips can help absorb harmful gases that react with silver. 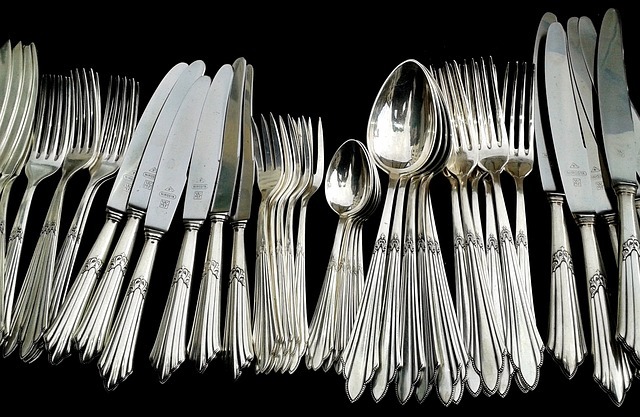 Of course, you should feel free to have your silverware on show, if that is what you’d prefer, after all, part of the enjoyment of antique silverware is its detail. If you wish to show off your silverware, consider a cabinet to display the items and still protect them. You can also buy microcrystalline wax polish to use on the silverware items that you wish to display to help protect them from humidity, dust and pollutants. Hopefully, this guide has provided solid advice on safely storing your silver to protect it from damage and tarnishing. Remember to decide whether you want to store or show your antique silverware, and then take steps from there to ensure your precious items maintain their beauty and value. 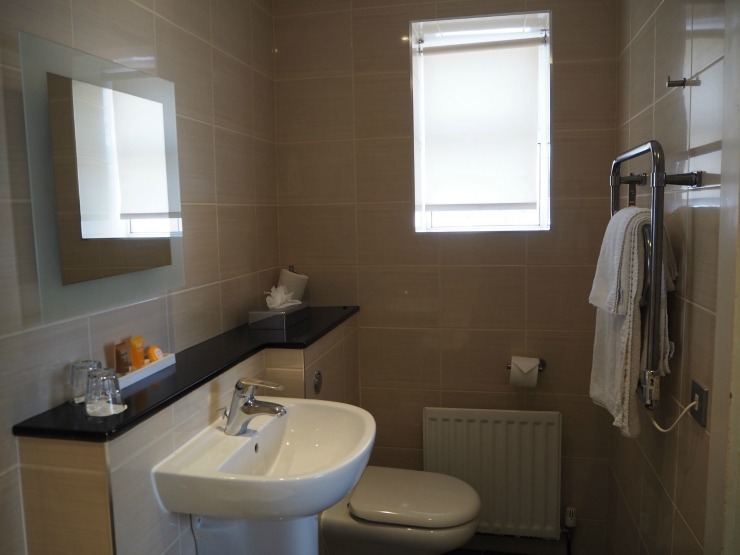 Running a home can be a pretty expensive business, especially when you have a family to feed, electrical devices on the go and your heating on full in the evenings. The idea of running your home more economically may seem completely impossible, but luckily you would be wrong. Here are some ways to cut your household bills, saving you money so you can spend on those little luxuries that are important to you. If you think you are spending a lot of money on your lighting at home, take some action and switch to energy efficient bulbs. There are plenty of brilliant energy saving bulbs on the market which will save you a ton of money and last longer too than your old-fashioned light bulbs. Electricity is the number one priority when you move into a new home, and it will likely be one of your biggest costs. 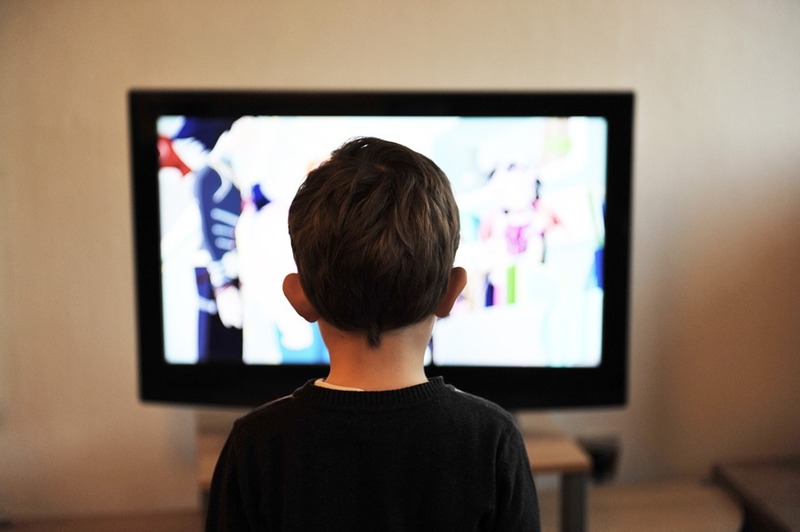 With everyone owning a mobile phone, tablet and computer these days, as well as TV and all your appliances, you stand to use a lot of electricity. When you move into your new home, think about switching energy suppliers. The easiest thing you can do is compare the prices online. Most energy companies will have incentives to join as a new customer and then you can reap the cost benefits. Water is not a cheap commodity to have at home, and you will find that when you have a large family you go through water very quickly. 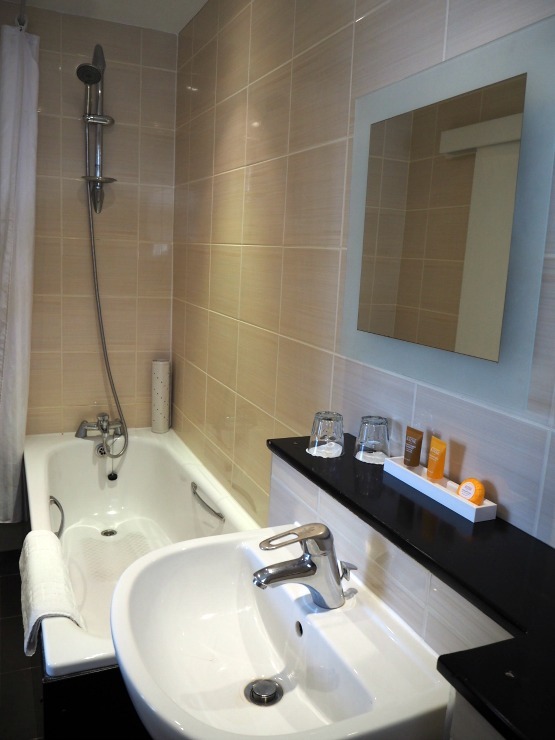 To reduce the amount of water you use every day, try and keep the baths to a minimum, showers are far more economical. When you step into the shower it might be tempting to spend an hour contemplating life, but realistically you should only be spending 10 minutes or so inside. By reducing the time you spend in the shower, you reduce the water you use and therefore your energy bills. You could also try a water meter if there are only a couple of you in the household, as it could be a cost-effective way of paying for your water. When you move into a new home it might seem like you have to buy yourself a landline phone, but why? In this day and age, if anyone wants to contact you by phone they can simply call your mobile. Don’t feel as if you are forced to install a phone connection in your home because it simply isn’t necessary. Save yourself the money and the hassle of having cold calls come through to your home phone every day by not having a landline. Tell me do you have any tips on saving home costs? If you have lived under a rock for the last year you may not realise that there is a big royal wedding in town! Since their engagement in November, it seems like everyone has been talking about the royal wedding to be, and now the date is getting closer here is what you need to know about the royal wedding. When: On May 19th 2018 Prince Harry, sixth in line to the British throne, will marry American actress Meghan Markle. 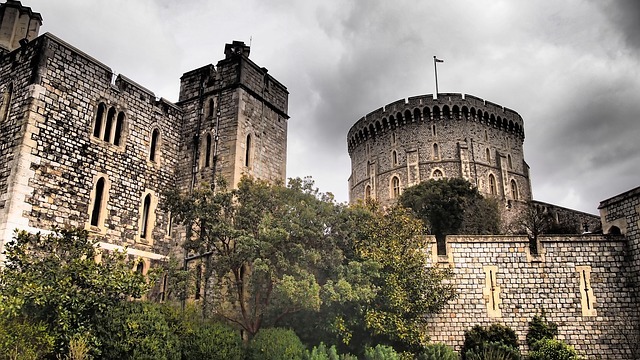 Where: The marriage will take place in St Georges Chapel in Windsor Castle, about twenty miles from London, at 12 noon. After they take their vows at Windsor Castle, at 1 p.m. they will get into a carriage for a procession through town and return to the castle along the Long Walk, the impressive tree-lined avenue. Windsor Castle is a beautiful castle. If you want to visit admission fee is £21.20 per adult £12.30 per child, under 5's free and concessions available. Unfortunately, admission is not available for the royal wedding due to security restrictions, only those members of the public and charities that have scored invites will be able to stand in the grounds and watch the couple as they leave St George's Chapel. Instead, why not visit after the event to see where it all happened? All is not lost though as those who journey to Windsor on the day will be able to watch the ceremony on big screens in the Long Walk and Alexandra Gardens. They can watch the procession along the whole route. If you want to have a glimpse of the happy couple why not stay close by? 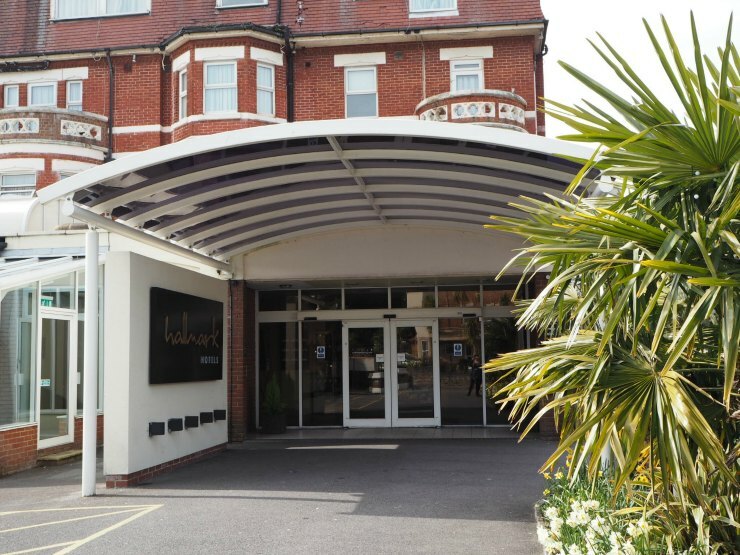 There is availability still at a handful of hotels near Windsor, such as the Devere Beaumont Estate at £255 for the 19th or the Royal Adelaide Hotel at £305. 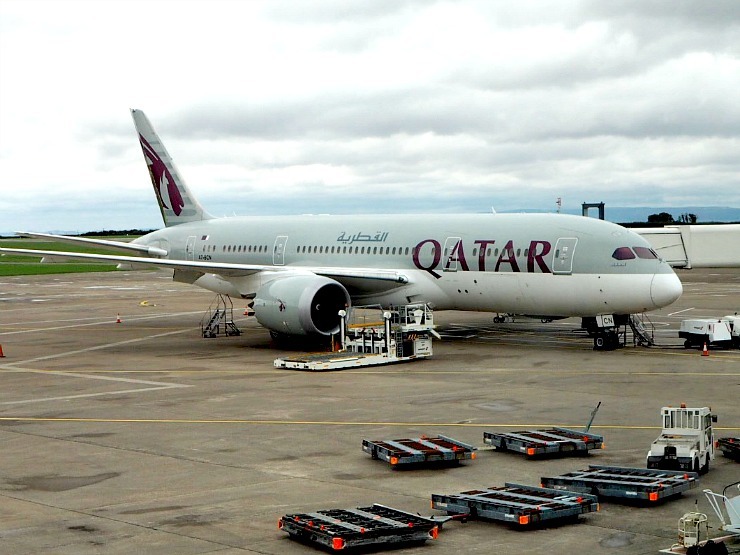 Or stay further afield in London where you have a choice of hotels from budget to 5-star hotels. There will be road closures starting early in the morning on the wedding day so for those staying in London, or travelling to Windsor it would be best to take a train, and to leave very early. 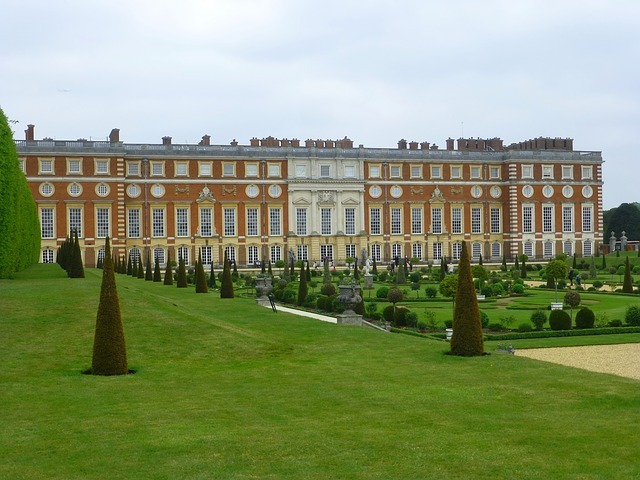 Why not make a weekend of your visit to the area and visit some of the attractions around such as Legoland Windsor, Thorpe Park, Syon Park Gardens and Hampton Court Palace? 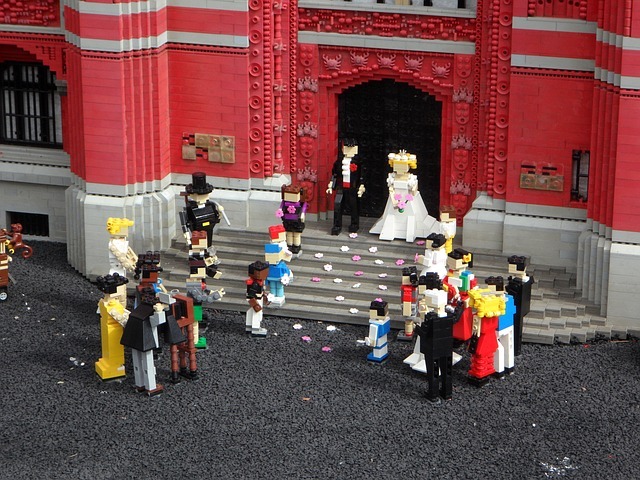 You may even see a wedding in Legoland if you don't get to see the royal couple. 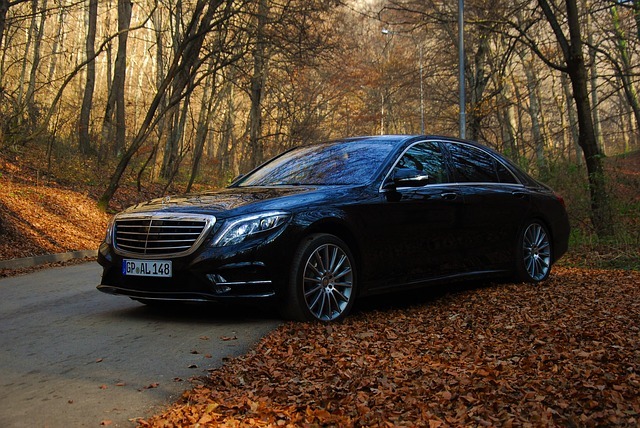 If you want to travel in style and have limited time, why not try a chauffeured car service for a full day trip to Windsor castle in a luxurious Mercedes S class? With a professional driver, free Wi-fi, drinks, magazines and that touch of class you can dream you are a royal for the day. Tell me, will you be celebrating the royal wedding? We all like to document our travels these days, and with the smartphone being the ultimate portable camera more of us are doing it than ever. I don't know about you but so many of my personal memories are intrinsically linked to the places I have been, the people I have met and the photos I have taken. Taking that perfect photo to remember those moments, to share with family and friends and on social media is what many of us strive to do. I do feel it's important though to live in the moment too and not get obsessed with creating perfection. After all, even if your photo isn't the best there is a plethora of editing software available that can help you crop, highlight, saturate, and sharpen. If you are starting to get serious about travel photography though, you may want to buy a good quality camera, such as a mirrorless or SLR camera as they are more flexible and better in low lighting conditions like an Olympus Pen or Canon EOS. Once you have that perfect camera, picking that destination for amazing photography is the next important thing. 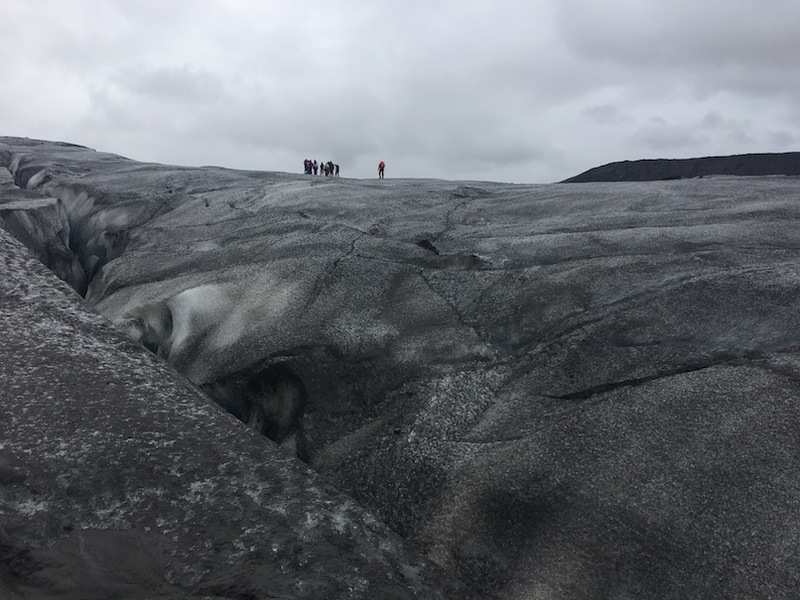 My favourite destinations for fabulous photos include the stunning landscapes of Iceland, the French and Italian-influenced architecture of Nice and the iconic skyline of New York. If you don't know where to start, here is an essential guide by Clifton Cameras, on what to what to pack, travel considerations and best destinations to get that perfect travel photograph. If you are looking to upgrade your camera check out the range by Clifton Cameras including Canon, Olympus and Sony Cameras. 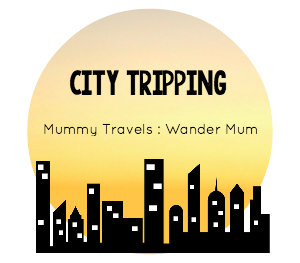 My camera of choice is an Olympus Pen whilst Mr W loves his Canon EOS 80 D.
Tell me, do you like taking travel photos? What is your favourite destination for fantastic travel pics? If you have invested in a polytunnel, then chances are that you are going to want to make the most of the money that you have paid out. But, if you are new to gardening and growing your own food, you may find that it isn’t as straightforward as that. Polytunnels are an incredibly useful addition to any garden. They make sure that your crops, no matter what it is that you have decided to grow, are protected against pests and the weather too. They are the ideal alternative to buying a greenhouse and because they come in so many shapes and sizes, you can make sure that you find one that is going to fit in perfectly with your garden. Another great thing about polytunnels is that they don’t always have to be expensive. Of course, there are those that are going to cost more, yet this isn’t always the case and you can find one that works perfectly for your garden. 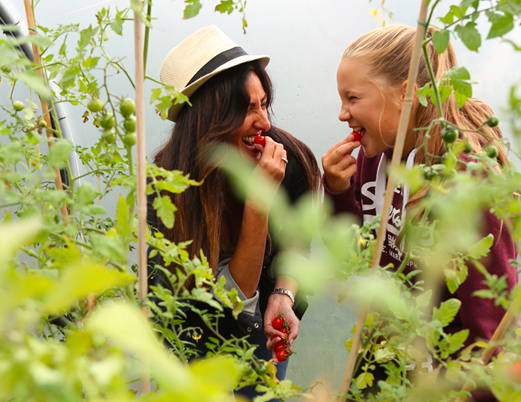 To help you out, we have put together our guide to the top 3 tips on how to get the most from your polytunnel this Summer. Before you even start popping plants in your polytunnel, you need to make sure that you have a plan for how you are going to use the space. You need to know exactly where you are going to put particular plants, as well as when you need to sow them. It also makes sense to place plants that are going to be planted and then harvested at the same time together, as this makes taking care of them easier. However, you don’t always have to take a “uniform” approach to your gardening. Instead, you can put together different plants that grow well together such as onions and carrots, or basil and tomato. In no time at all, you will have a plan for how you want to use the space. When it comes to planning out how a polytunnel is going to look and the layout that you are going to use, the most common approach is to have one path down the middle of the tunnel, with beds found on each side of the path. Of course, if your polytunnel is on the wider side then you might be able to have two paths and more beds. Another great idea when it comes to layout is to have one path to the side, then smaller paths branching off of it. Not only is this great for making the most of the space that you have, but it also gives you the opportunity to try out diverse growing too. We all too easily only plan for the floor space that we have, failing to consider the rest of the polytunnel. This is a big mistake to make, as vertical space can be incredibly valuable when it comes to growing plants and crops. The shape of your polytunnel is what makes a difference here. Whilst it may not be particularly tall at the sides, where your beds are, it will rise higher in the middle. Which will mean that you have plenty of space to grow upwards. There are a number of ways that you can use your vertical space, you could opt for plants that grow upwards (known as vining plants) as well as buying vertical garden structures which are designed for growing vertically. A good plant to try and grow in one of these vertical gardens are salad leaves or herbs. 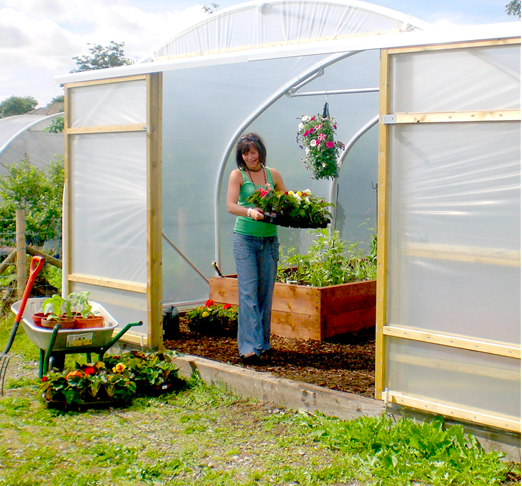 As you can see, a polytunnel is an incredibly useful tool for your garden. Not only does it give you a space to garden year round, but it also provides a variety of plants with the ideal base to grow. Best of all, if you find them from a good quality supplier, then you can be sure that your polytunnel is going to stand tall, no matter what the weather throws at it. Keeping those all important plants inside perfectly safe and growing well. So you have met the love of your life and you want to ask for their hand in marriage. It's an important moment in your life so you want to do it right. Here are some things to consider before you pop the question. If you are a traditionalist and she's close to her parents, you may want to ask permission to marry her. It's a nice gesture and one they will probably appreciate. If you are worried that it may be seen as an antiquated tradition just phrase it carefully and ask for their blessing. Dating back to ancient Egypt, engagement rings are a symbol of never-ending commitment and unity. If you want your proposal to be a complete surprise, try and get an idea of the style of engagement ring she likes beforehand. Would she want a simple but chic round brilliant cut solitaire diamond ring, a stunning emerald cut stone, or would she want something completely different? 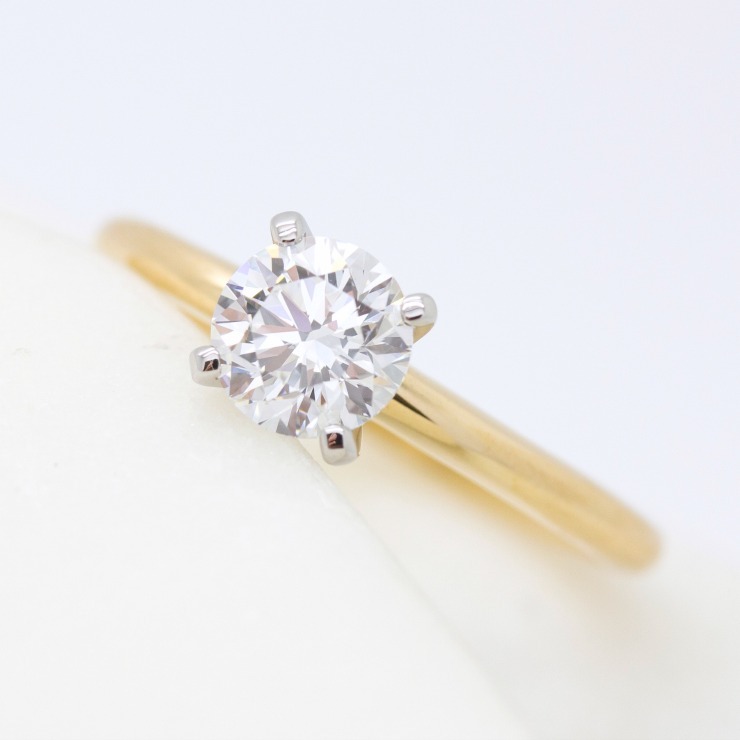 A bespoke engagement ring is another totally unique idea. You could always go window shopping and drop hints to see what she likes. If you’re not sure, consider a silver and cubic zirconia ring as a stand-in until you both go shopping together for that perfect engagement ring. This could be a memorable date, such as her birthday, Christmas Day or Valentine's Day, or the date you first met. The important thing though is to choose the right moment. Only do it when you are ready and you are sure she will say yes. You may just want to be spontaneous and do it at home over a roast dinner like Prince Harry and Meghan Markle, then if so the date won't matter. 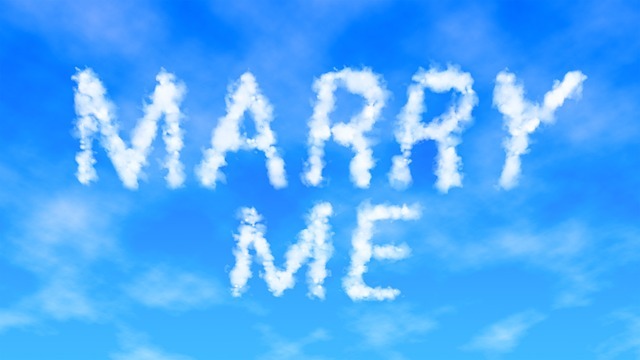 A romantic gesture could be to whisk her off to a dream destination to propose. Ideas could be, at the top of the Eiffel Tower, on a gondola in Venice, or in a hot air balloon. Another idea is on holiday on a favourite beach, under the stars. You can't get much more romantic than that! If you want something personal to you both, what about the place where you went on your first date? If it's the local nightclub or cinema though it may not be the best place! So you are thinking of proposing, are you going for the traditional way of getting down on one knee or something totally different? There is a fashion at the moment of using a flash mob to sing a proposal. What a romantic and memorable way of proposing that she will never forget! My husband proposed to me on the North Pier in Blackpool, maybe not as glamorous as Venice but just as special to us and yes he did get down on one knee. For more inspiration check out this video below by London based jewellers Taylor & Hart. This award-winning jeweller has a range of rings to meet your every need including individually designed bespoke rings for that perfect proposal. I hope you enjoyed this post. Let me know it has been useful! Dirty, hectic, impersonal, a sprawl. These are all things that Nice in France is not. We decided to visit for my birthday in March. 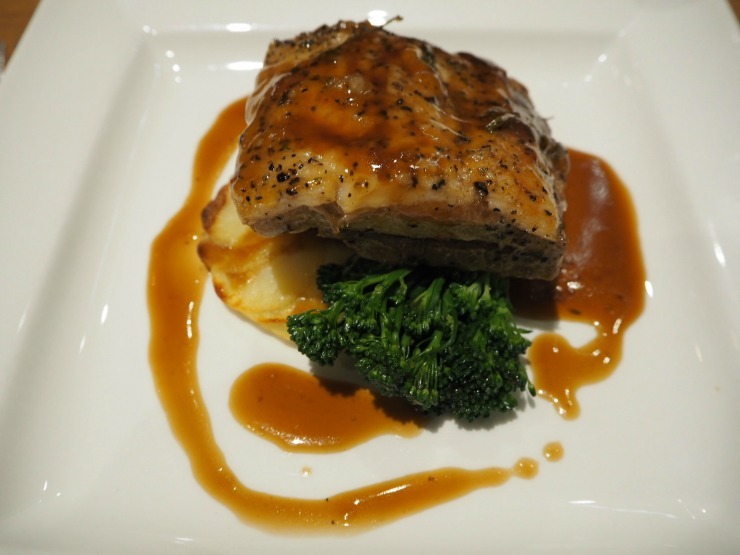 I had visions of a glamorous break, with wine, lots of wine and great food. Would the capital of the Côte d’Azur, and France's fifth largest city live up to my expectations? I hoped it would! We took an EasyJet flight from Bristol airport to Nice. With the flight being around an hour and forty-five minutes, the cosy flight (read no leg room) was ok. It was fairly cool on board but I recommend booking extra legroom seats if you like space and don't like being cramped. We took an Uber to the hotel a short 20-minute drive away. You could also take an airport bus at 6 Euros each way which has space for luggage, or the local bus that costs 1.5 Euros. The Uber was 17 Euros, and worth considering for ease of use, door to door and especially if you have two or more people travelling with a number of bags. 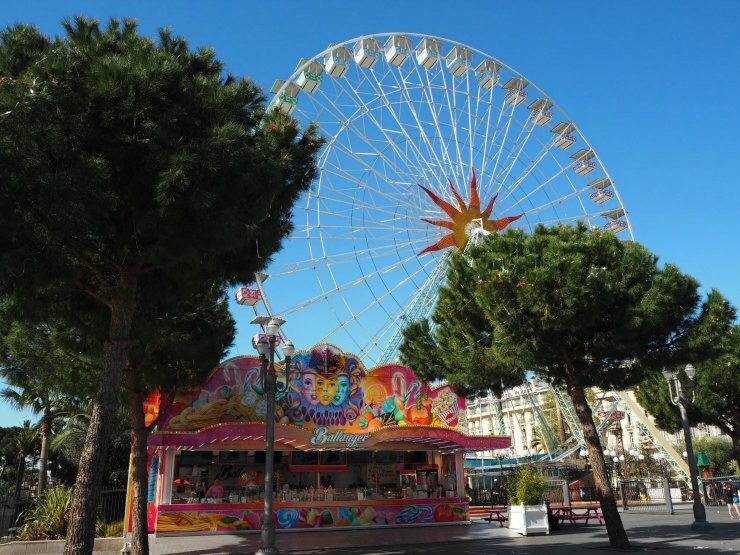 The taxi took us past the famous Promenade Des Anglais, the vast paved promenade that runs for 4km along the seafront. We stayed at the Hotel Grimaldi. The small boutique hotel 10 minutes walk from the Promenade Des Anglais was well priced at £70 a night including breakfast, but alas it was not perfect. I won't go into details here but I guess you pay your money and you take your chance as they say. There are plenty of well-priced hotels out of high season however, we were surprised how cheap accommodation was so you will be spoilt for choice. 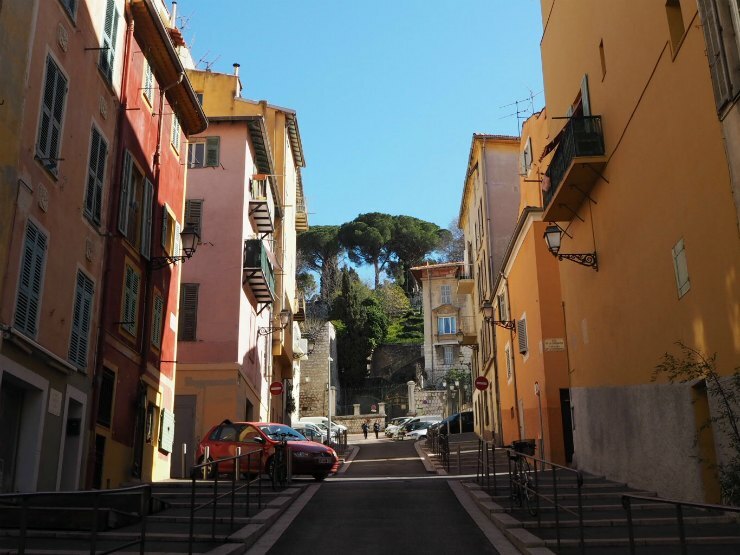 This post is about Nice, however, so let's get onto exploring this interesting city. That night we ate at a lovely little French bistro called Davina, which was next door to the hotel. 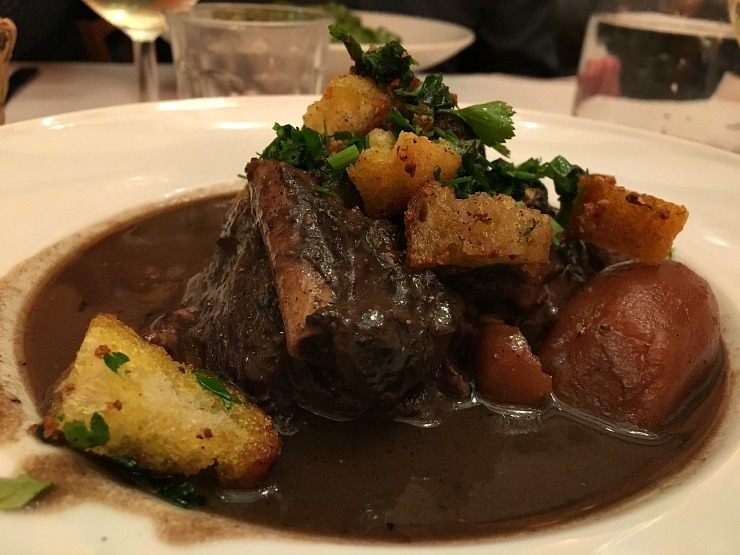 The food was outstanding, we had a really fresh calamari with garlic aioli, French onion soup, a tasty Coq Au Vin and pasta with pesto. All washed down with half a litre of white wine, and all costing about £50. Bargain! After staggering the 10 steps to our hotel, we decided to have an early night ready to explore Nice the next day. The next morning, fresh as daisies, we decided to take the 'Hop on Hop off' bus tour of the city. 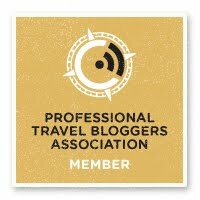 We were given the French Riveria pass by the tourist board to try out during our stay and the tour was included so this was great news. 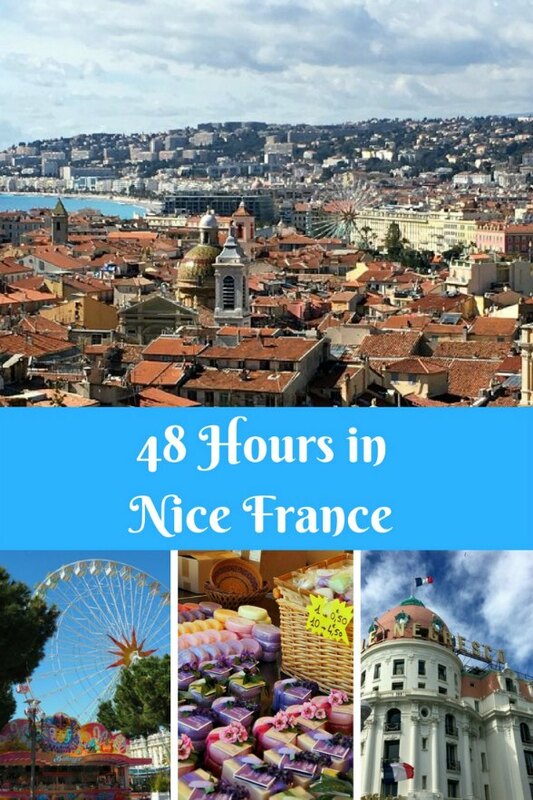 Priced from 26 Euros for 24 hours it is certainly worth considering if you are going to do a number of museums and activities in the city and surrounding area. To get to the pickup point we walked up to Place Massena. This is the main square in Nice and is full of life, a great place to people watch. 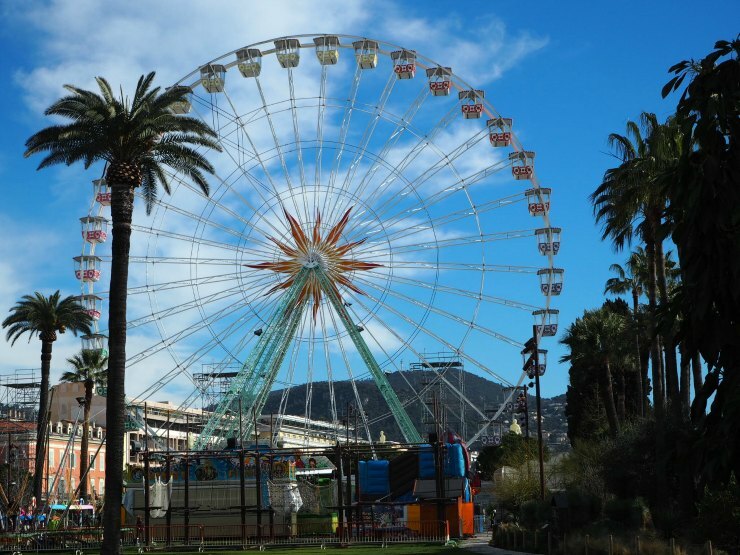 The Nice carnival was only the week previous, and there were a big Ferris wheel and a few attractions left for children. After we walked through the area we got to our bus stop for the 'Hop on Hop off' tour. On this first use, all we had to do was sign and date the back of the French Riveria card and then present it. This was then scanned by the bus driver, as easy as that. We were given some headphones and we both dashed to the top on the bus to get a good view. 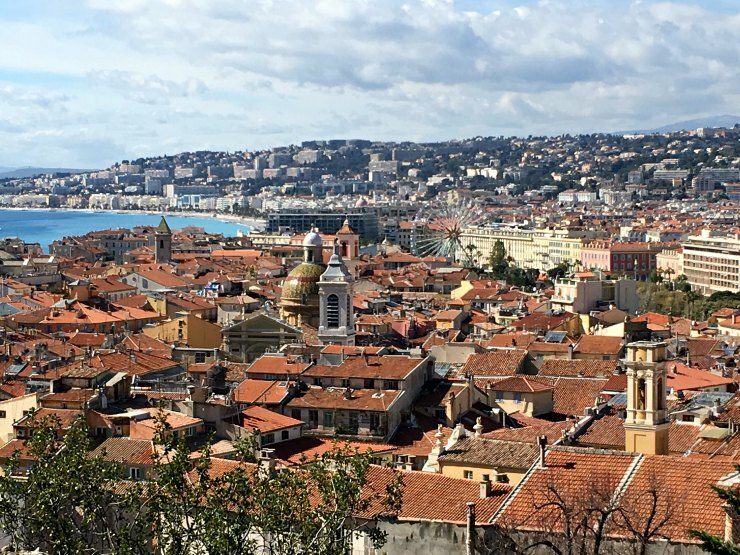 It was lovely to see the sights of Nice as the bus wound it's way up through this mesmerising city and down back onto the Promenade Des Anglais. With 14 stops and a commentary in English and French it's a great way to see the city, you just hop off when you want to get off and hop on when you went to see more from the comfort of the bus. 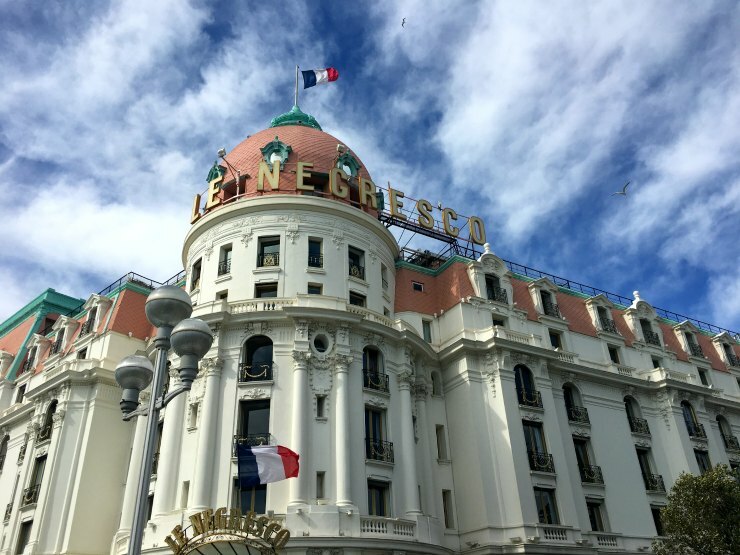 From the top of the bus, we saw the stunning 5-star hotel, Hotel Le Negresco, a beautiful art deco building on the promenade. I would have loved to have gone inside but unfortunately, we didn't on this trip. All the more reason to go back! 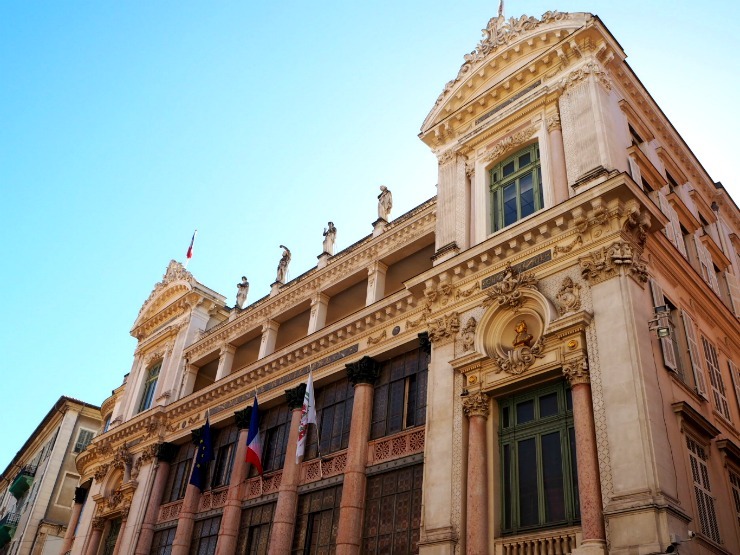 Nice is full of amazing architecture, and if you are an architecture lover like me then you are in for a real treat. 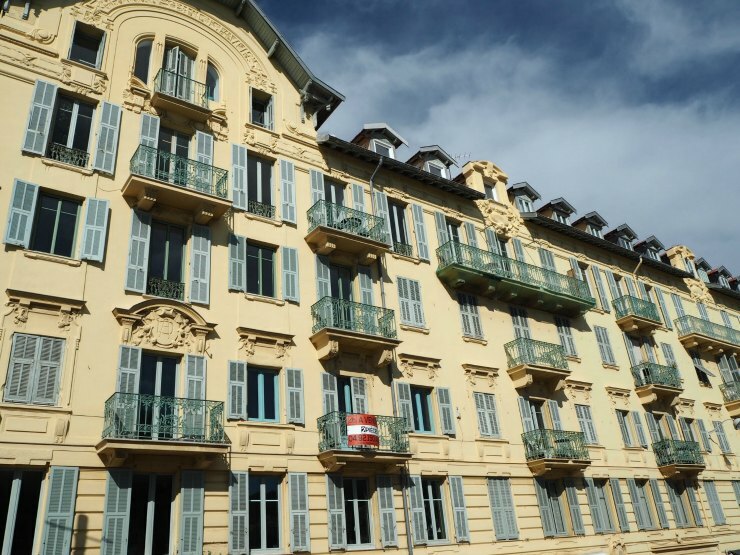 A mix of French and Italian architecture, there is a large Old Town (Vieux Nice) with striking buildings and a lovely harbour area. You can see why the city is named Nice la Belle or Nice the beautiful. We stopped off at two points on the bus tour - to visit the Marc Chagall museum and to see the Russian Orthodox Cathedral. 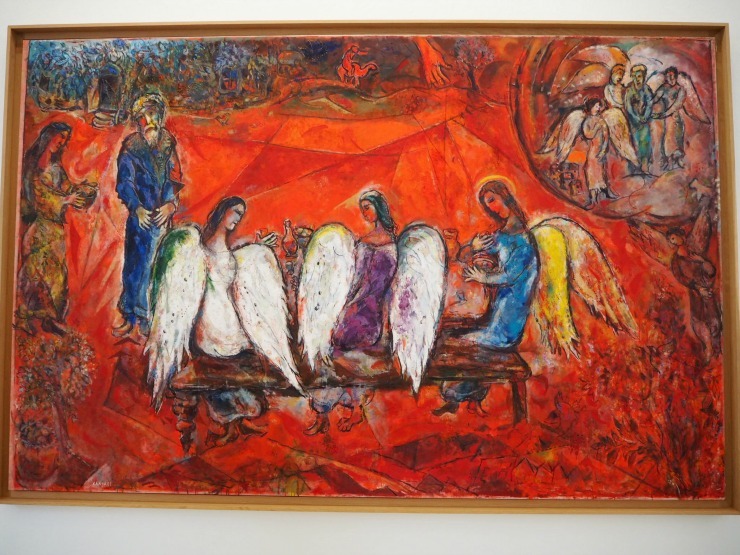 The Marc Chagall museum is included on the French Riveria card, and without a card admission, the price is 10 Euros. This permanent collection is the largest collection of his work in the world. Although undeniably striking, the religious connotations of his art, based on the Old Testament themes may not be for everyone. If you wish to visit allow an hour or two for your stop. When we left the museum we must have timed it right as we caught the bus driving down the road. Next stop - the Russian Orthodox Cathedral. I saw this building online but still I think my jaw literally dropped when I first gazed upon this unusual and ornate cathedral, something you don't expect to see in Nice. 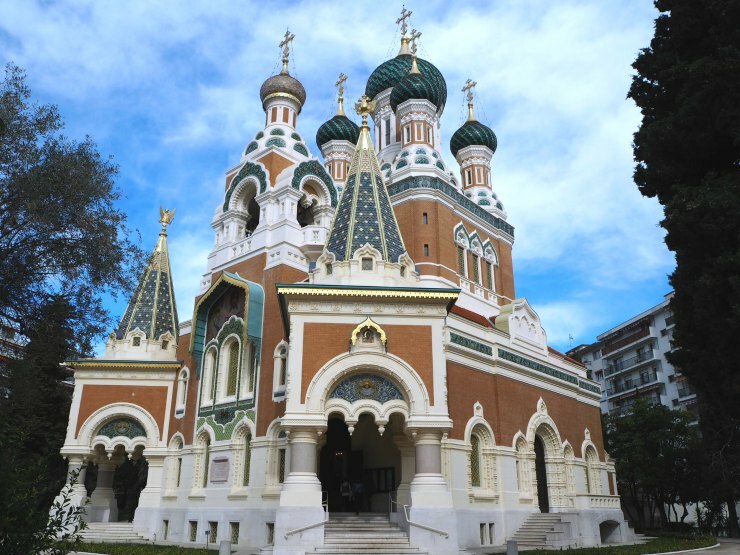 Beginning in the mid-19th century, Russian nobility visited Nice and the French Riviera, following the fashion established decades earlier by the English upper class and nobility. In 1864, immediately after the railway reached Nice, Tsar Alexander II visited by train and was attracted by the pleasant climate. 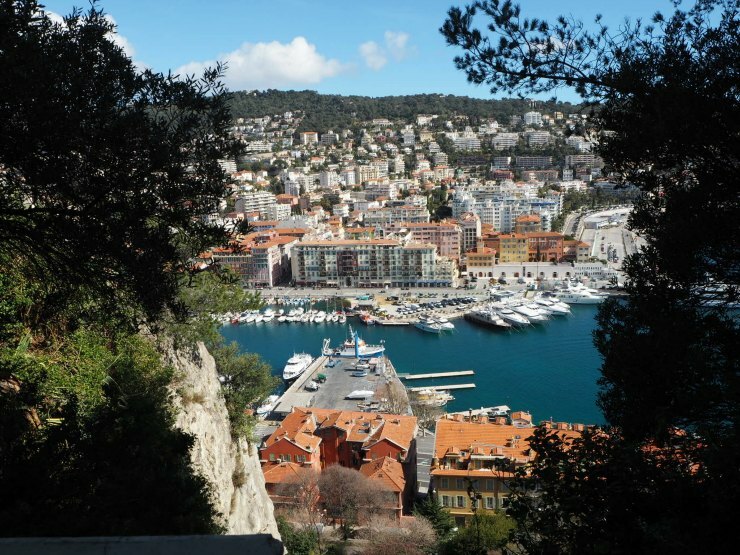 Thus began an association between Russians and the French Riviera that continues to this day. The cathedral was opened in 1912, thanks to the generosity of Russia's Tsar Nicholas II. The French Riveria card gives you a free guided tour in English once a day but we were early so we decided to explore the cathedral ourselves. The inside contains a vast collection of religious icons, decorative woodwork, and detailed silver inlaid designs and is certainly worth seeing. After we visited the cathedral we decided to stroll back to the hotel after stopping in a little bakery for a fresh pizza and ham and cheese baguette. Nice has a number of little bakeries, and with the smell of freshly baked goods wafting into the air, it's hard not to stop in one as the tempting smells lure you in. That night we ate in the Hard Rock Cafe Nice, not an authentic French restaurant of course, but reassuringly good. We spotted it the day previously on the Promenade Des Anglais. The Hard Rock Cafe in Nice is quite small but perfectly formed and the food was tasty. 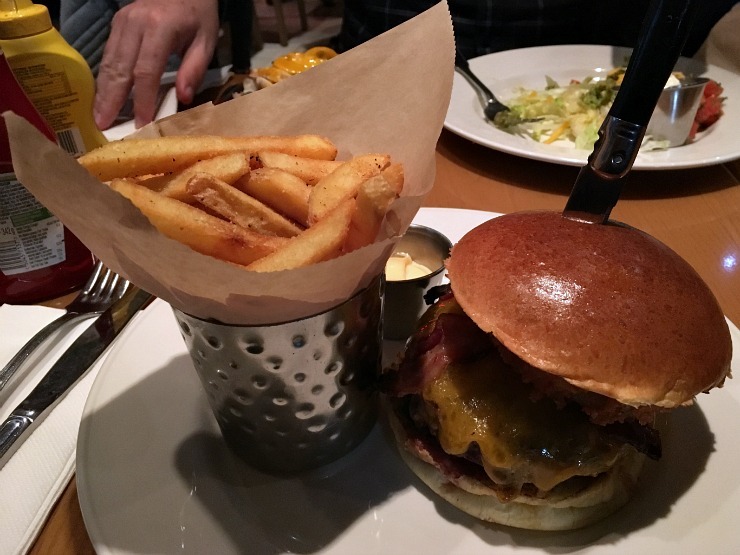 I always have the Legendary Burger, a juicy beef burger topped with onion rings, bacon and all the trimmings, whilst Mr W usually has the fajitas. Delicious! 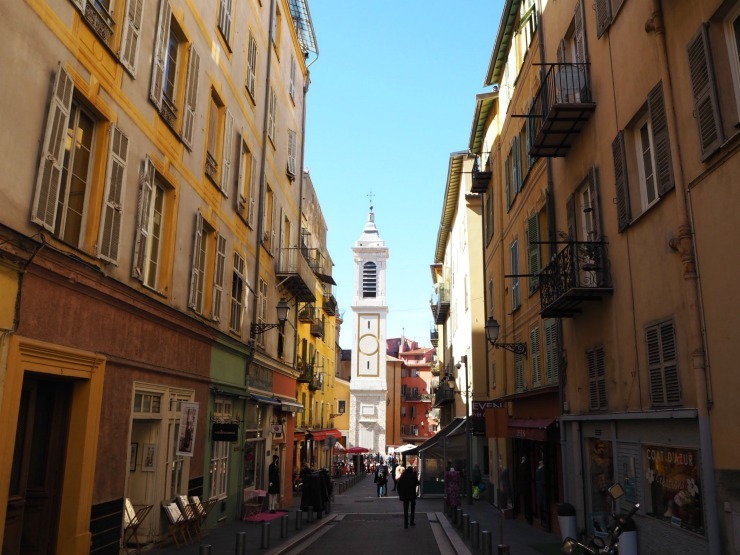 The next day we decided to explore the old town called Vieux Nice. Get here early in the day to explore the Cours Saleya. 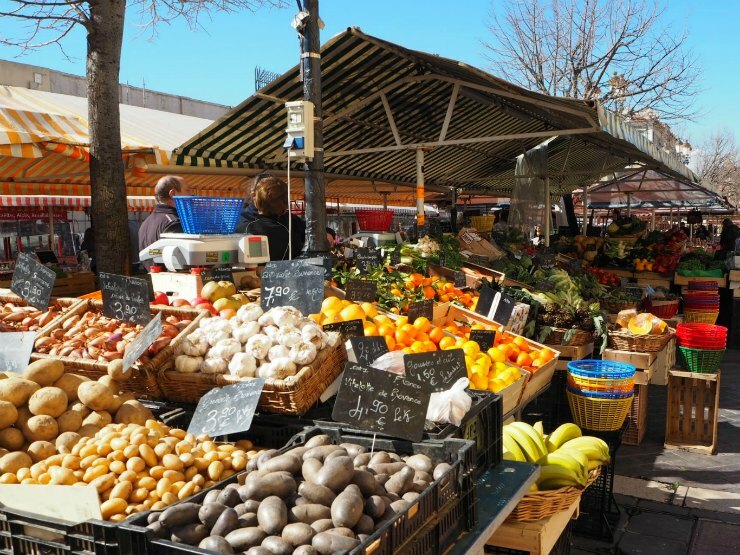 The Cours Saleya is Nice's vibrant flower market, a place where traders sell flowers, fruit, vegetables, soap and gifts. 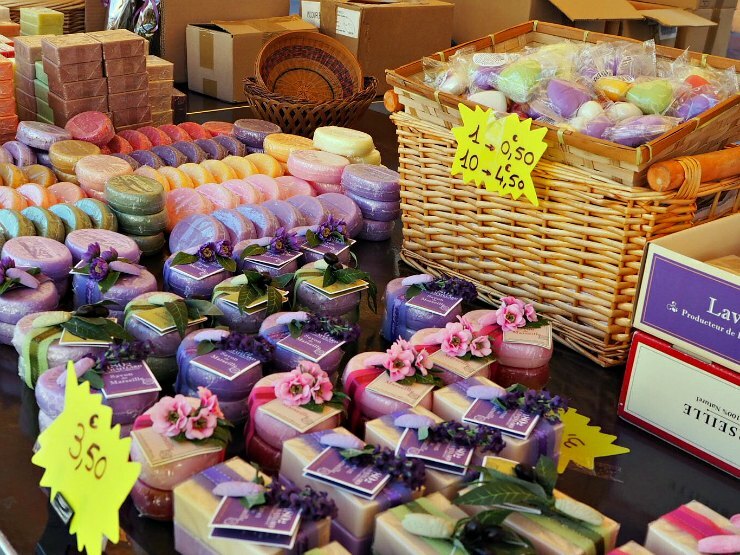 I have to admit, I couldn't resist the beautiful soaps and bought a couple of bars which cost 1.50 Euros each. If you like the soap the more you buy the cheaper it is, so I recommend stocking up for gifts to bring back. The Cours Saleya is also a place to have a drink and people watch in one of the many bars and restaurants lining the area. We stopped for a drink and jumped when, at 12 noon, a noise of a cannon going off surprised us. This tradition goes back to 1861 when a British man set it off to call his wife back to prepare lunch. This tradition was later made a law. Today this has been replaced by a loud firework resembling a cannon. If you are in the old town listen out for it every day. The shops in Vieux Nice are so lovely. I had to stop at Maison Auer to admire the mouthwatering chocolates and chocolate covered almonds. One of the prettiest chocolate shops I have been, I have to admit I was so taken with the shop, that I forgot to take a photo! As we meandered through the streets, we came upon a hill which looked intriguing. I just adored the ice cream coloured houses. It reminded me of a Disney version of what the Americans think France looks like. Of course, all of France isn't as beautiful as this. We got to the top of the hill and was rewarded with this chocolate box view. Breathtaking. At the top of the hill is Chateau Cemetery. 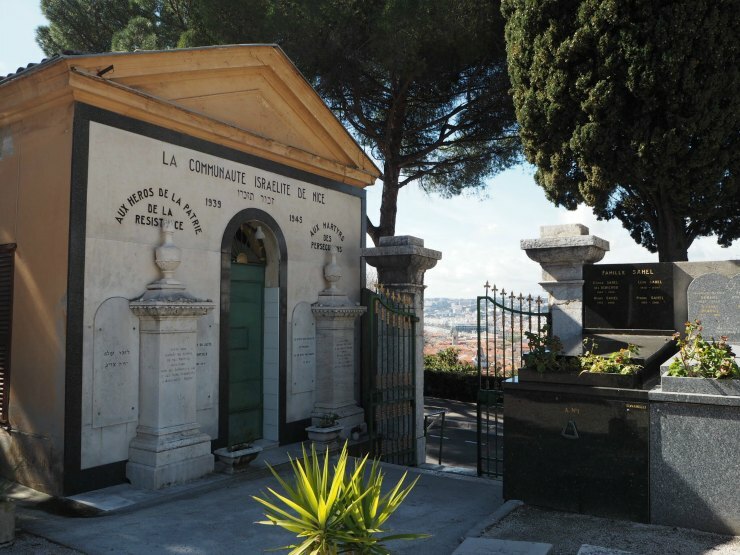 This large cemetery overlooks the whole of Nice and is really interesting, having both a Christian and Jewish area. The monument to the French Jews that died and the heroes of the resistance is so moving. There are a number of stones around the monument, a Jewish custom to remember those they have lost. A few more steps and we came across a waterfall, again another unexpected delight from this beautiful city. 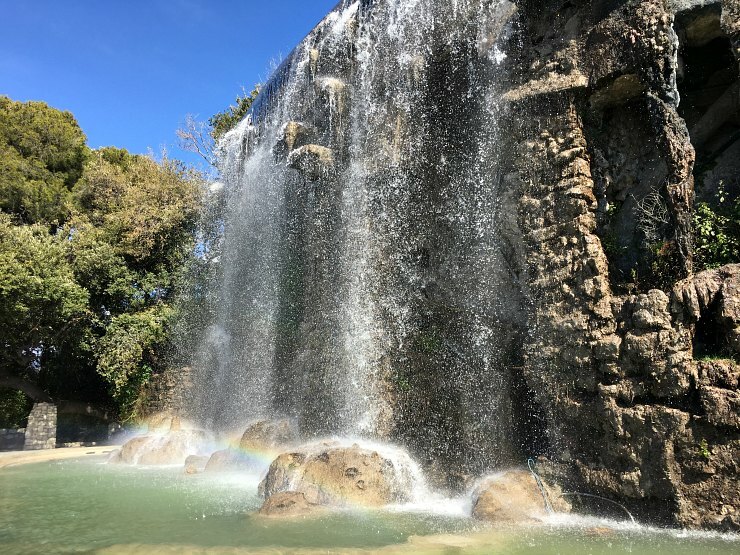 This waterfall on Castle Hill isn't big but the spray creates a stunning rainbow, and the area has amazing views. A short walk from here is a Parc Du Chateau. Again with amazing views, a children's playground, a cafe and a number of shaded areas, it is certainly worth the walk to get here. I mean look at this view below! We left the park via the stone steps towards the Promenade Des Anglais, also known as the Bay Of Angels. 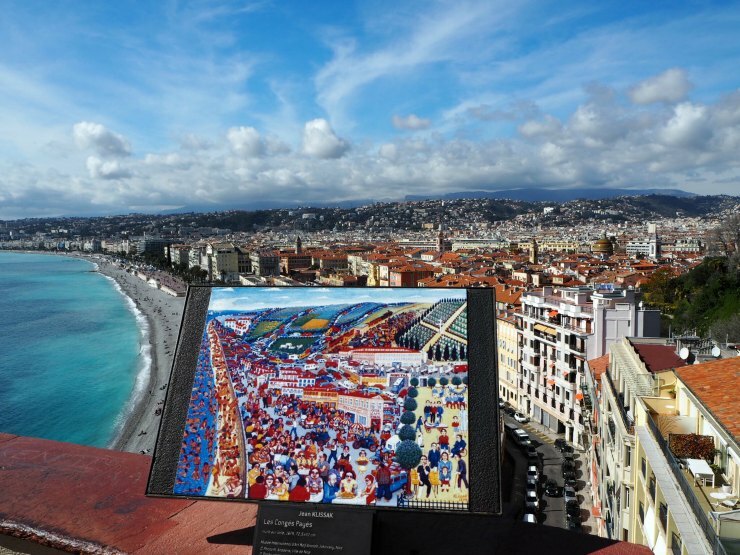 The 4km sweep of bay has a lovely walking path, and in 2015, the city of Nice submitted the Promenade Des Anglais for UNESCO World Heritage status. This process can take up to 10 years to complete, but I am sure this will happen one day. As we walked down the steps I couldn't help be in awe of this amazing city. As well as the Italian influenced architecture it has a vibrancy that only the best cities have, a mix of wide streets but also small ones you can get lost in, a character that is uniquely its own. All things that The Guardian newspaper says makes a city attractive. 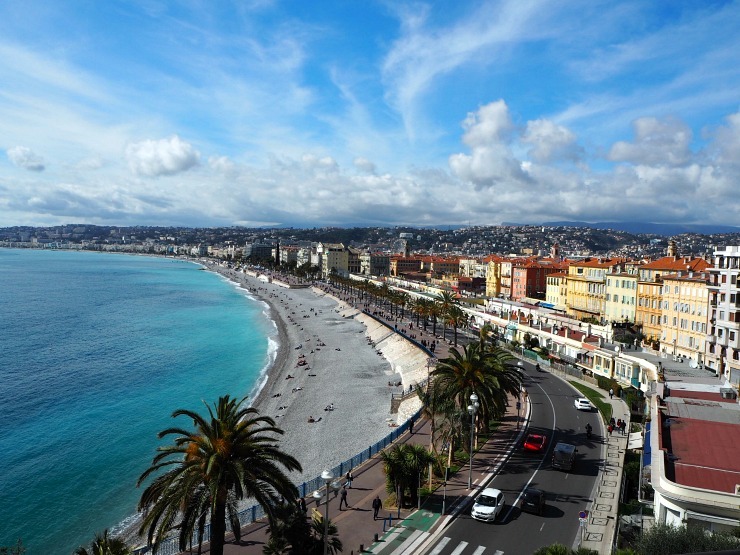 The city is also extremely well placed on the South of France in the Cote D'Azur. 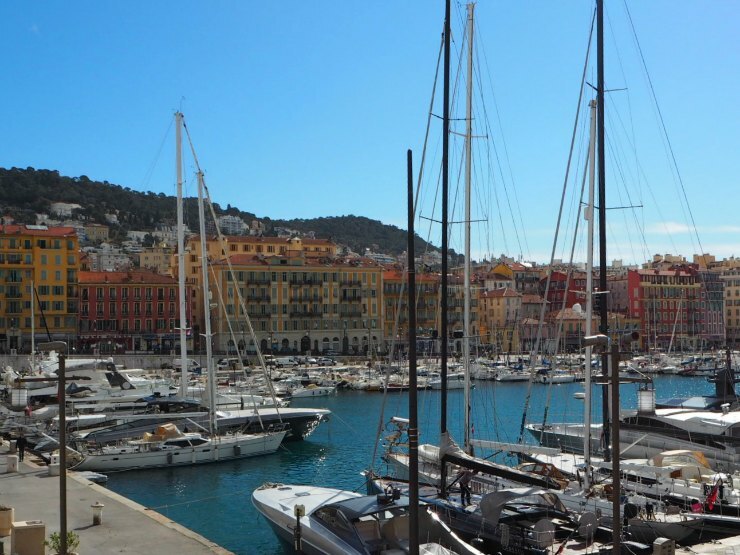 Within a short drive/train journey are Cannes, Monaco and Antibes. 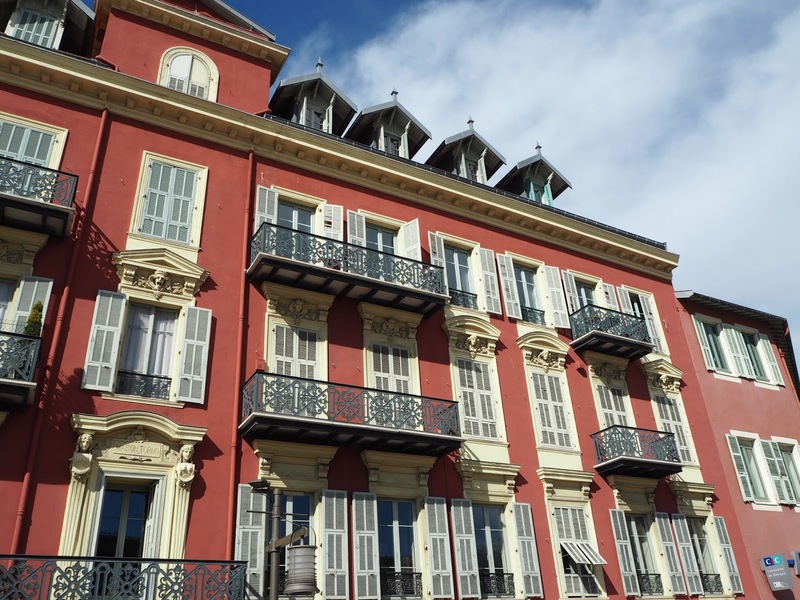 We spent another couple of days in Nice and explored Monaco and Monte Carlo one day and more of this striking city the other. 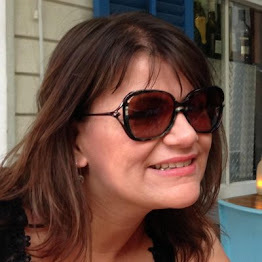 I would love to explore St Tropez on a return visit as there are lots of cool things to see and do there. So did Nice live up to my expectations? Oh yes! 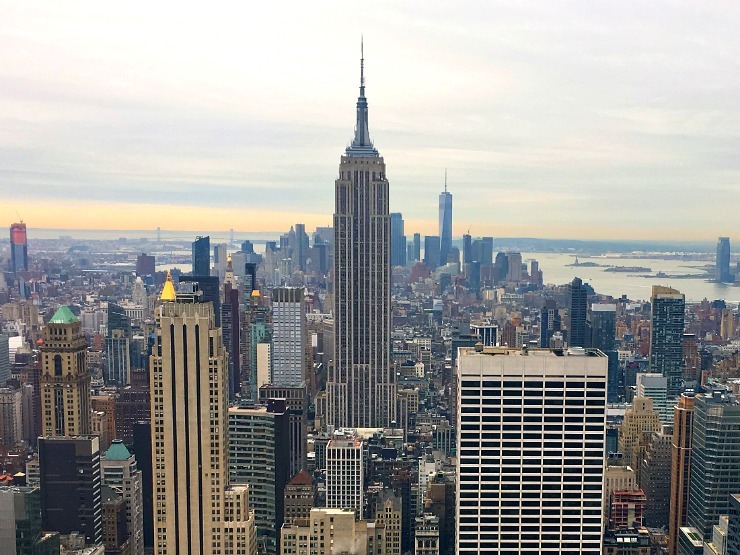 The city has glamour, fantastic architecture, great museums and a style all of its own. It also has wine, lots of wine! Sorry, I took no photos of the wine, we were busy drinking it! 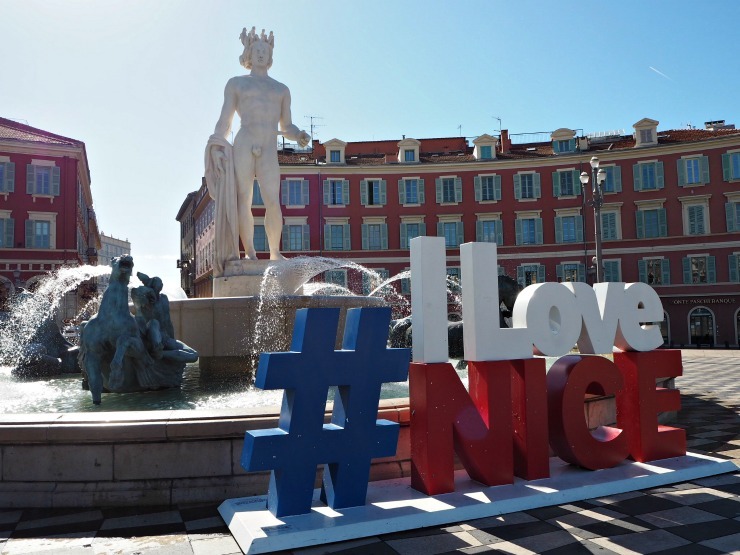 Tell me, would you visit Nice? What would appeal to you in this area? Service, service, service, one of the most important aspects of a good hotel. Not just service, but great service. Whether it's a five-star hotel or a budget motel, the stay can be made or ruined on the service you receive. 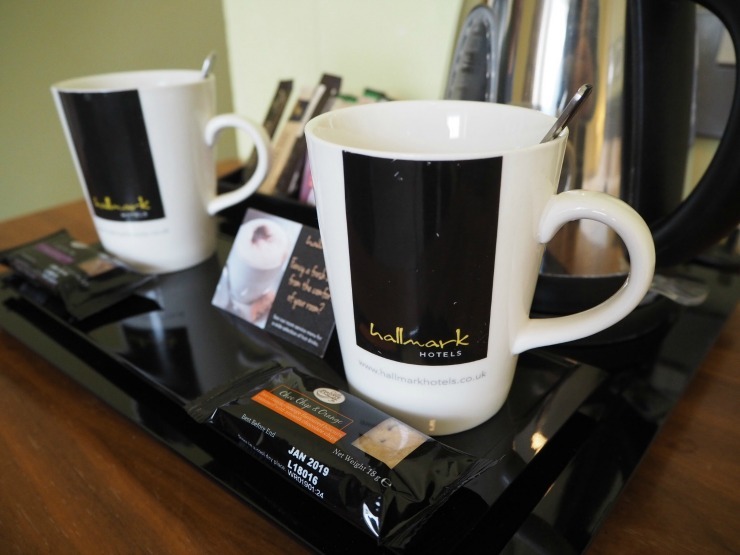 Well on my recent stay at the Hallmark Hotels In West Cliff Bournemouth the service was fabulous, and one of the many reasons to stay here. After a 4-hour car journey from South Wales, we arrived tired but looking forward to our stay. We were greeted by Marianne the receptionist. who checked us in. Marianne explained the facilities and didn't rush us which I appreciated. She was really helpful and courteous. Our first impressions of the hotel were good. Next to the reception area is the bar and restaurant and the bar area was light and airy. Adjacent to this is the bar area and one an undercover pool. 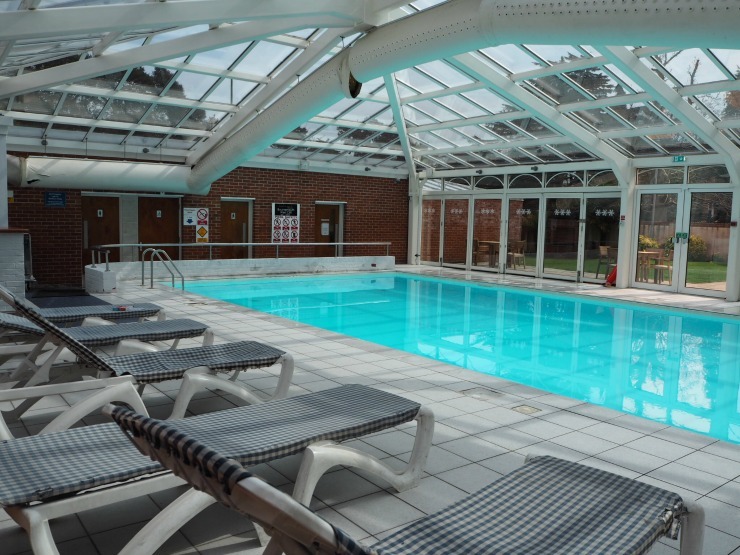 The pool had a number of sun loungers, on which you can relax and was covered with a glass roof which let in lots of light. We had to walk through the bar area to the side corridor to get to our room which was on the first floor. There is a lift in the hotel but not to the rooms that we were in. If you have mobility issues be sure to ask where you are staying and if it is accessible via the lift. Then up to the room. The room was a good size. 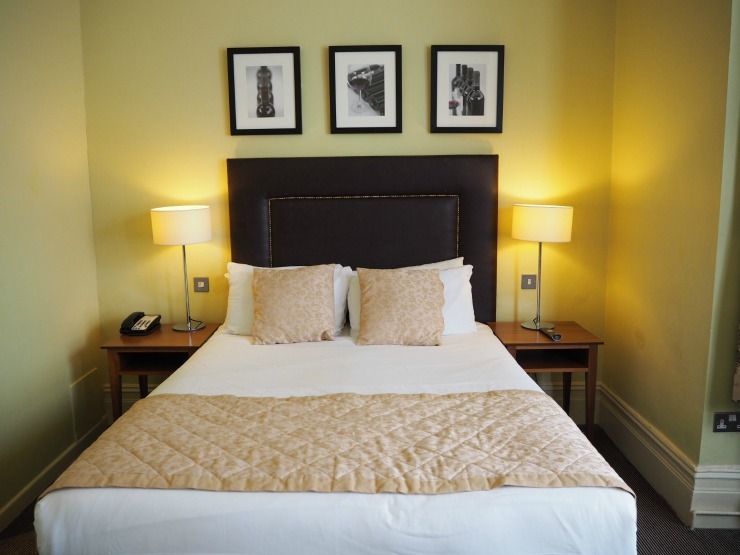 The double bed was to one side of the room, with crisp white sheets and two table with lamps. The tea and coffee tray was a nice touch and the biscuits were great - choc chip and orange anyone? A big plus point was the ability to refuse to housekeeping if staying for more than one night and having a complimentary drink at the bar instead. This is a great little perk for the customer, makes financial sense to the hotel, and is eco-friendly too. 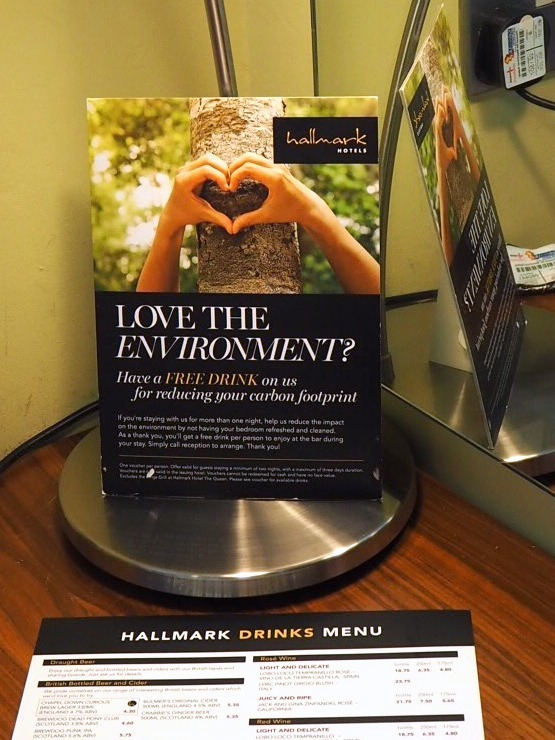 Well done Hallmark Hotels! 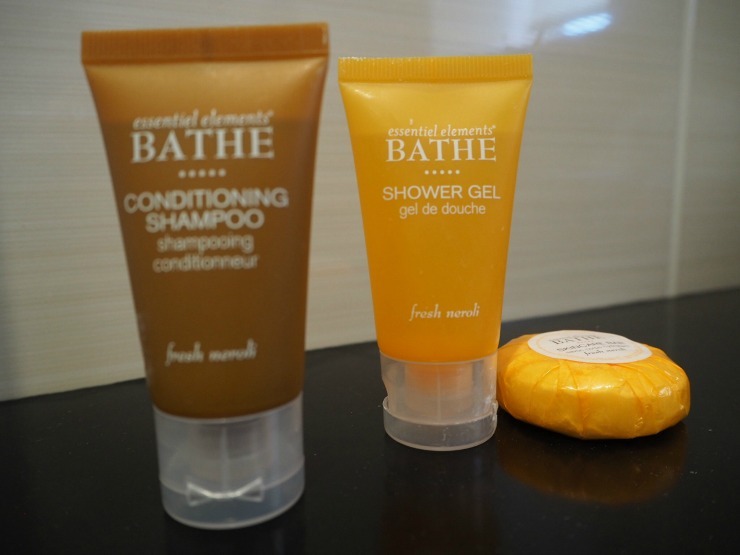 It’s nice to see a room with a bath and shower and toiletries that were complementary. I felt like the room was in the middle of a refurbishment. The carpets were in very good condition but there could have been some attention to detail elsewhere. The paint was a little scuffed, wooden furniture was worn and cushions and valance on the bed were a little bobbly. The bed was comfortable though and everything was clean so that was good. A little note, the shower pressure could be better, which didn't bother me but it may do some. The bedrooms do not have air conditioning but fans are provided. It was a warm day in April and we did need to use a fan during our stay. Windows do open though so that was great to have fresh air, as in many chain hotels the windows do not. About an hour after we got to our room we had a courtesy call to ensure everything was ok - a nice touch! Before I knew it, it was time for my treatments. I had booked these previously and I would recommend you do so, especially on the weekend as they were busy. 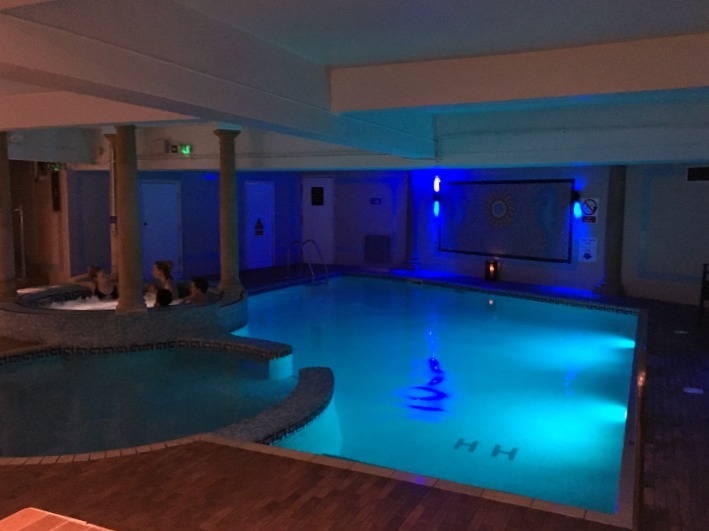 The spa facilities at the Hallmark Hotel West Cliff Bournemouth consist of five treatment rooms, a steam room, sauna, spa pool, jacuzzi and indoor swimming pool. 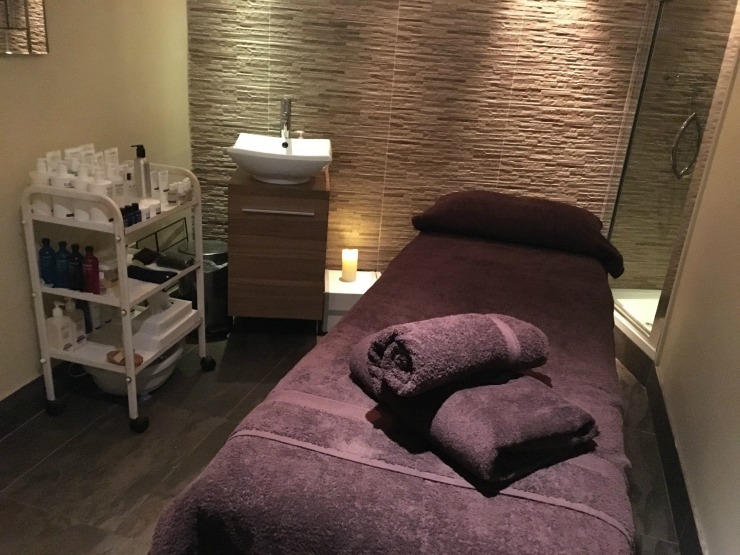 There is a full menu of therapeutic treatments such as aromatherapy, massages, salt scrubs, mud wraps and reflexology, and a number of beauty treatments too. Packages include a choice of treatment, use of the spa facilities, robe and slippers, and lunch or afternoon tea included. 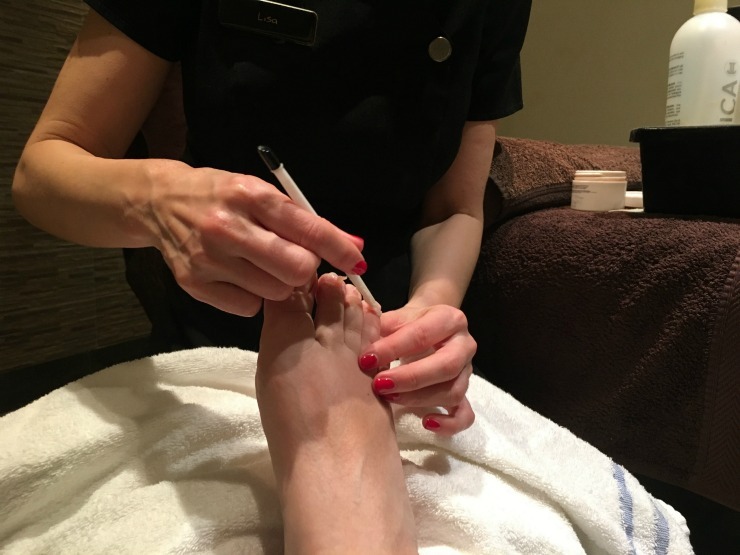 I had booked a deluxe pedicure ( £35) and a back, neck and shoulder massage (£37). I felt these treatments were well priced for a hotel spa. 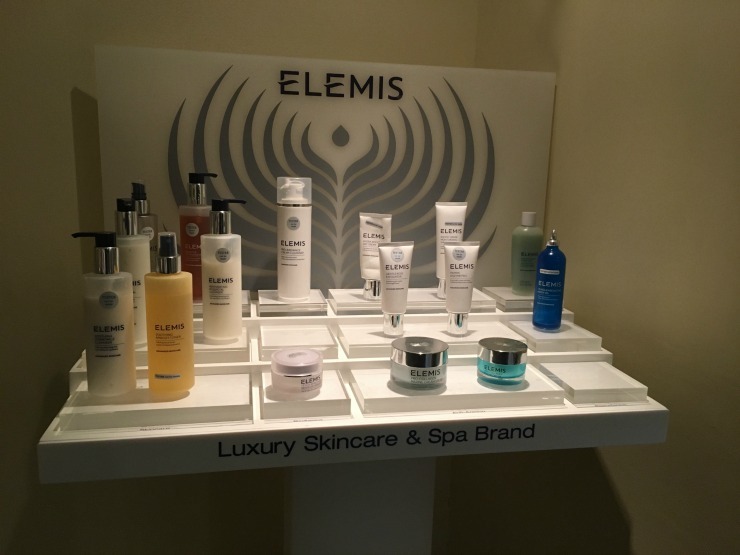 Lisa, my beauty therapist, let me choose an oil from a selection for the massage, and before long I was being pampered with a very good massage. Lisa was very personable and good at putting me at ease, which is exactly what you need when you are having such personal treatments. The music in the spa was very relaxing and helped set the atmosphere, and before long all the stresses and tight knots in my back melted away. After a short interval, I then had the deluxe pedicure. I have had a few pedicures in my time and I thought this one was excellent. 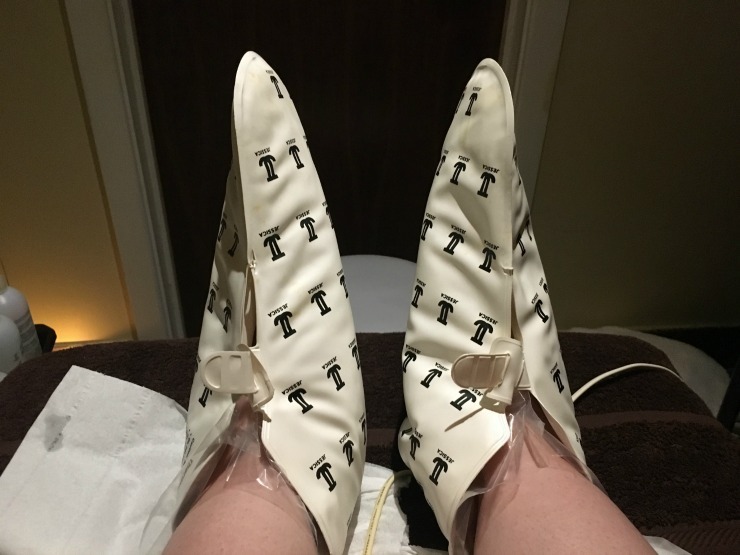 The luxury pedicure included a paraffin wax treatment to soften hard skin on heels and this really appeared to work on my feet. The bootees to help the paraffin treatment. I was very pleased with the finished result. Thanks, Lisa! That night we ate at the hotel. You can pay as you go for dinner or book a package in advance including room, breakfast and dinner at £103.50 per double room. This seemed like a good deal but if you wanted to stay for room only, then rates on the website are from just under £50 a night. First I had the prawn cocktail. I was really looking forward to this but when the prawn cocktail came, it was a little disappointing, unfortunately. A small number of prawns on a mound of shredded iceberg lettuce accompanied by brown bread (and butter?) and a wedge of lemon. 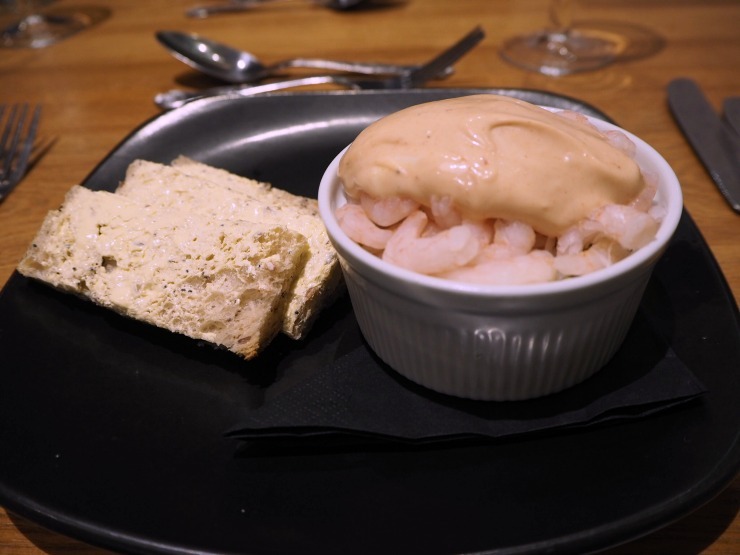 The issue I had with this dish is that the prawns lacked any flavour and were obviously frozen, the brown bread was fresh but the spread was bland and didn't taste like butter. I know this is a chain hotel but I would have preferred 3-4 fresh prawns instead, even adding one or two to the other prawns would have made this dish so much better. Next up was belly pork with a ginger glaze. The belly pork was a decent size and had a salt and pepper skin, but the fat needed to be rendered down to make it unctuous, instead, it had a layer of fat underneath the skin. The accompanying potato slices were lovely though and the broccoli was a nice accompaniment, a little more ginger in the glaze would have been great. 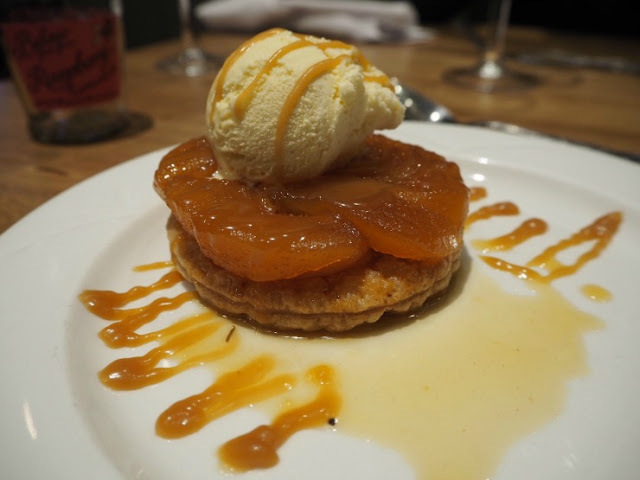 The dessert was a special of Tarte Tatin. I thought it looked really appetising and was very well presented. The tart was delicious, the caramel sauce slightly bitter. Mr W had a much better meal. 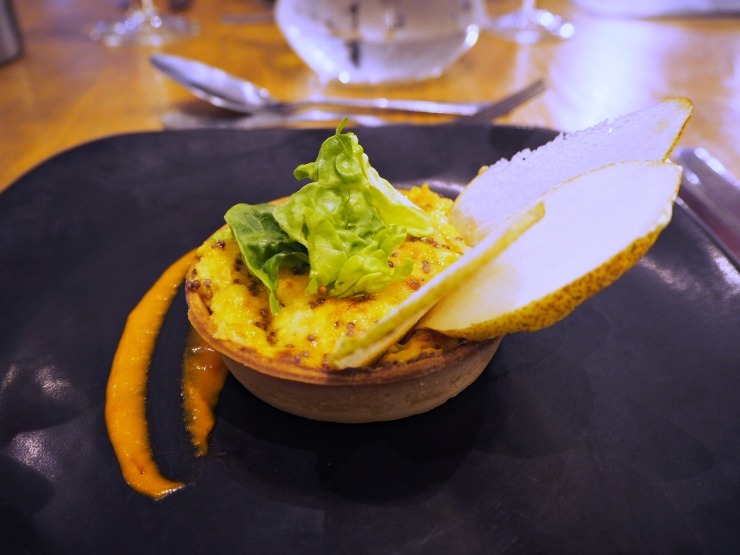 His Welsh Rarebit cheese tart was very tasty indeed, the rich cheesy filling was incredibly tasty, the mustard really adding a lovely tang, the pastry case was crisp and the thin slices of apple added a nice sweetness. This dish was excellent. For mains, a well-sized portion of homemade pasta was presented. Filled with broccoli, pea, lemon and cheese filling, it was really delicious, the lemon and freshness of the ingredients came through well. 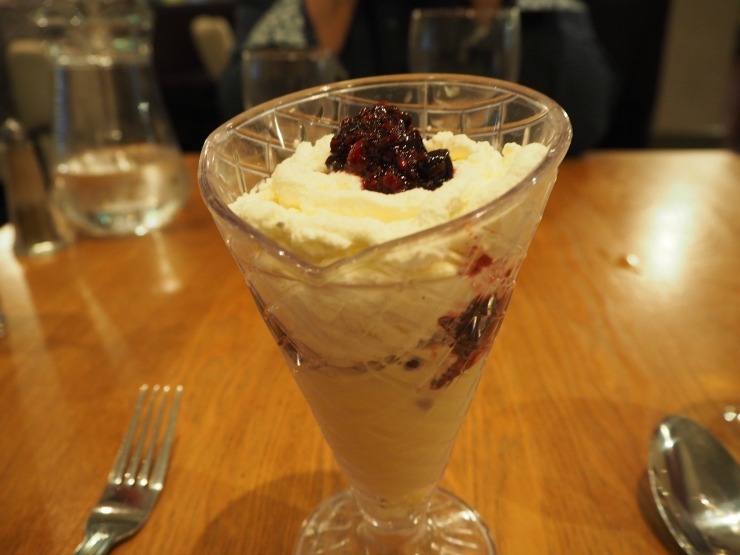 Dessert was 'Hallmark Glory', a concoction of summer fruits, sweetened cream and ice cream. Now this could have had more ice cream and the berries tasted more like blackcurrants but it it was enjoyable still. The prices were average for what you get in a decent restaurant (£7 prawn cocktail £16 belly pork) but if I was honest the food was a mixed bag. Some highlights like the Welsh Rarebit, but also lowlights like the prawn cocktail. When you have a wealth of restaurants on your doorstep in Bournemouth, I think the hotel could do better with their food choices. 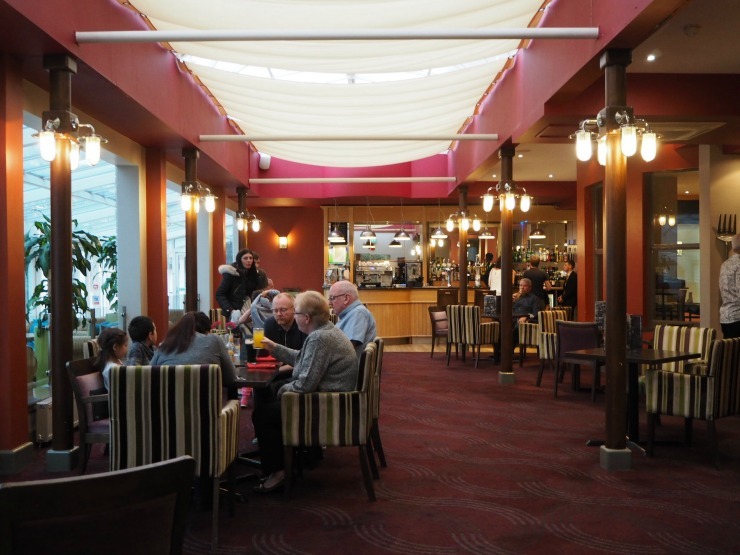 Service was excellent though, the staff were really lovely, attentive and are obviously well trained. Next morning we went down to breakfast. 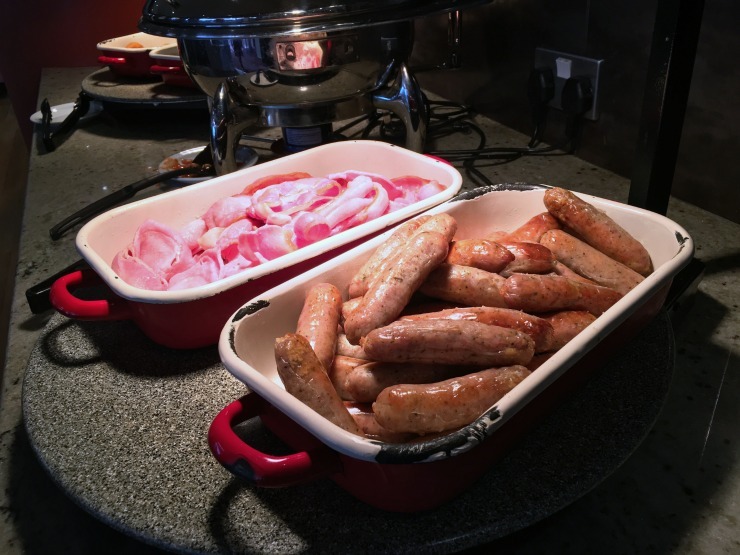 Breakfast consisted of a choice of croissants and pastries, bacon and sausages, fried and scrambled eggs, beans, black pudding, and mushrooms, cereals, yoghurts, toast and fresh fruit salad. Juice was concentrated but there was a good selection of herbal teas, as well as coffee available. Breakfast was perfectly nice if you had it in the room rate. There are some additional costs that you have to factor in if you wish to stay here. 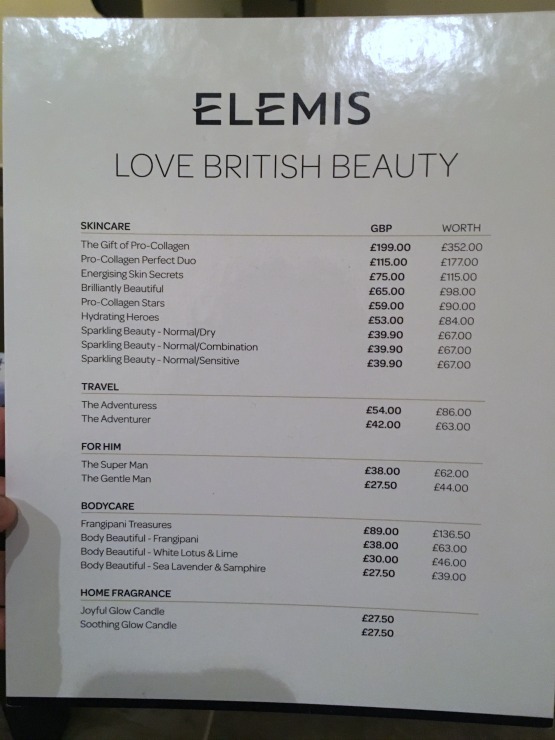 You have to pay £5 to use the spa facilities per day and £10 to park. The spa facilities consist of a steam room, sauna and indoor pool. However, if you did not want to pay this there is another pool (which kids are allowed in) which is complementary to use. I didn’t feel the prices were excessive but obviously, these extra costs can add up when you are staying here. of a refurbishment, which would be great when completed. 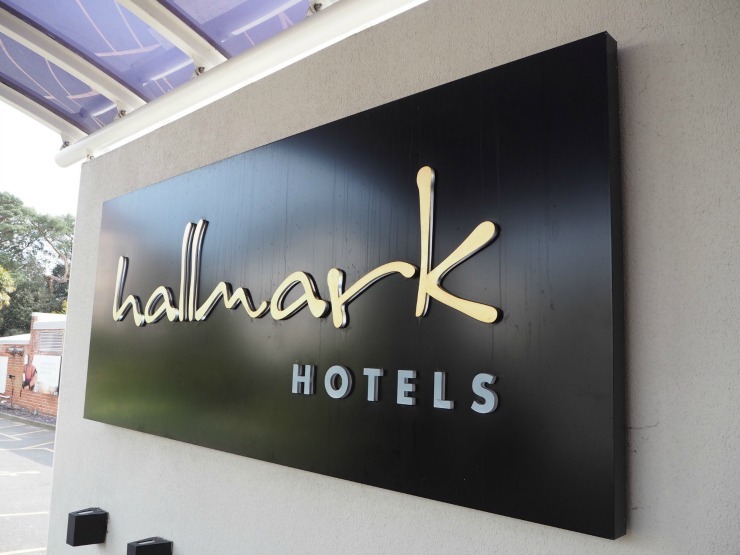 There are a number of Hallmark Hotels in the Bournemouth area, such as the Hallmark Hotel Carlton and East Cliff. What sets apart these hotels from others in the area is the pool facilities and again the well-trained staff. I would certainly stay in a Hallmark Hotel again in the future.